The Fiberglass Institute is pleased to announce Jonathan Appert has been awarded the WJA Memorial Scholarship Award. 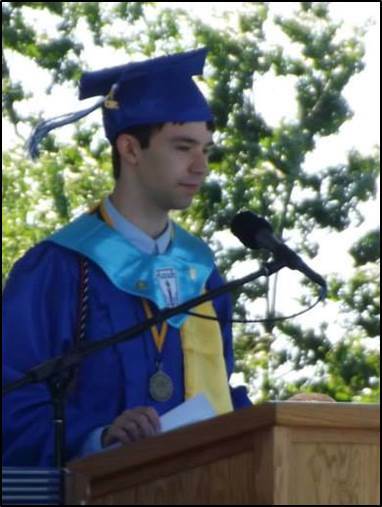 He is a graduate of Merrimack High School in Merrimack New Hampshire and enrolled at Northeastern University in Boston Massachusetts where he started in Chemical Engineering this past Fall. Jon’s scholastic and extracurricular activity achievements are admirable. He earned a 3.97 GPA, was ranked number 1 in his graduating class and named valedictorian. Among many activities over the past four (4) years, Jon was a member of the National Honor Society, in chorus, a pianist in jazz band, a music assistant at Faith Episcopal Church and volunteer at the local library. He also participated in the Science Olympiad National Tourney and in chorus advanced to Vice President of the club. Creativity was demonstrated through Jon’s essay, where he melded the subject of fiberglass with his perspective of the technology world and the journey ahead of him. Through his writing it was clear fiberglass raised from the “unsung hero” in his life to a vital material of construction serving as diverse a number of applications as there are career paths awaiting him as an engineer. Please join us in congratulating Mister Appert on his accomplishments in High School, acceptance at Northeastern and receipt of the WJA Memorial Scholarship award. We wish Jon continued success in the years to come! The WJA Memorial Scholarship Program has been established to support college freshman engineering students who share FRPI's core values.